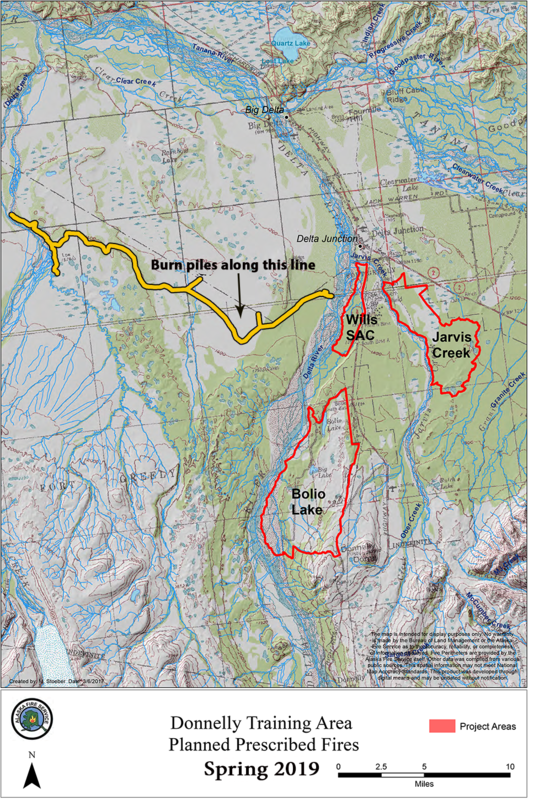 The Bureau of Land Management Alaska Fire Service (BLM AFS), in cooperation with the U.S. Army Alaska (USARAK) will burn piles of woody debris in the Donnelly Training Area (DTA) south and west of Delta Junction. Burning operations will start as early as Sunday, February 17 and may continue, as conditions allow, until Sunday, March 31. The piles, located on a new fire break west of the Delta River, are primarily composed of spruce trees that were cut over the past few years as part of a hazardous fuels reduction project conducted to mitigate the risk of wildfire on military lands. In accordance with an open burn approval issued by the Alaska Department of Environmental Conservation (ADEC), the piles will be ignited when weather conditions will minimize the impact of smoke on populated areas. The BLM AFS and USARAK work in conjunction with ADEC and the National Weather Service to forecast and monitor smoke conditions to ensure compliance with local, state, and federal regulations governing air quality. For more information about prescribed fire on the Donnelly Training Area and other U.S. Army Garrison Fort Wainwright lands, contact the BLM AFS Dispatch Center in Fairbanks at (907) 356-5555.